Heya, budding new fan here from the UK! So, hey there. I'm a guy from the UK who's hoping to watch Sailor Moon and become a fan of the series in the process. I WOULD put a link in, but i cant at the moment. "Wait, that's a Reigon 1 DVD, and you live in Reigon 2. How could you watch that?" I'll use VLC Media Player on my PC, which can play DVDs reigonless. If push comes to shove and that doesn't work, I'll use one of my PC's limited amount of reigon changes to change it to reigon 1, Since PC game DVD are apparently reigonless and I have other reigon 2 players anyway. I'm also a fan of video games (Currently playing a fair amount of Team Fortress 2 at the moment) and animation from the other side of the pond, ususally known as cartoons (I like me a bit of Ed, Edd n Eddy). I hope you'll enjoy my presence! What anime do you like other than (hopefully!) Sailor Moon? Are you a magical girl fan in general, or is this your first? This isn't my absolute first magical girl anime, as I have gotten 5 episodes into HappinessCharge! PreCure as well, but I do want to get into those kind of series, so why not start with the most well-known one in the West? Mostly Video Game Music??? Well Clegginator...you and I are on the same page my friend! Hello I am Sportsnutd/Sportsbot/Stephen/Ponybot and general nice guy!! Link to The Music Club! I would like to point out that GC has a Video Game Club! If you would like to learn more about it, you may do so here! Hello! Welcome to GC - I am Arkas, nice to meet ya! Welcome to the forums! And I had no idea VLC media player was region less. You learn something new everyday. It's great that we've got another videogame lover on the forums? Which platform do you play the most? I'm mostly on steam/PC. And edd edd n eddy is one of my favorite childhood cartoons! Do you like other cartoons from that era on cartoon network? I guess so. For example, I just learned that Japan is region 2 as well! I mainly PC game as well, but I do like some Nintendo as well. Out of curiosity what is your username inspired by? I.. haven't seen any of it yet. Did you read the first post properly? Hey, a question for when the DVD arrives: should i go sub or dub for the first time around? Depends on your preference really! I find the new dub is relatively ok. About on par with current dubs of anime. Nothing weird or bad but I didn't find it anything to sing home about either. If you don't mind reading subs and are used to hearing Japanese speaking people, then go for sub! I absolutely love the original Japanese VA cast and may or may not be biased towards it due to having so many years having to choose between the original Dic dub or hte Japanese. And Japanese always won lmao. Also, welcome to gc! I hope you enjoy the series once you get the DVDs! Huh. Sorry, I thought you said you had the DVD. ^^; My mistake. Hey! Welcome to the forum! Happy to see another gamer join the community. I'm Sephazon, former Miiverse community manager at Nintendo now living in Tokyo. ^^ I'd like to hear about what games you've played over the year. The DVD has arrived early! And it seems to load fine in VLC as well! It's a bit late over here in English-land, but ill make sure to watch it tomorrow! Awesome! 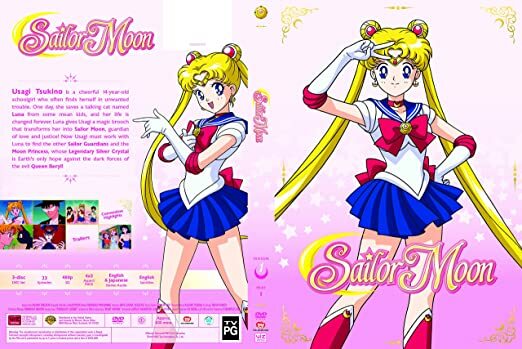 Feel free to post in the Sailor Moon Anime discussion section to let us know what you think!